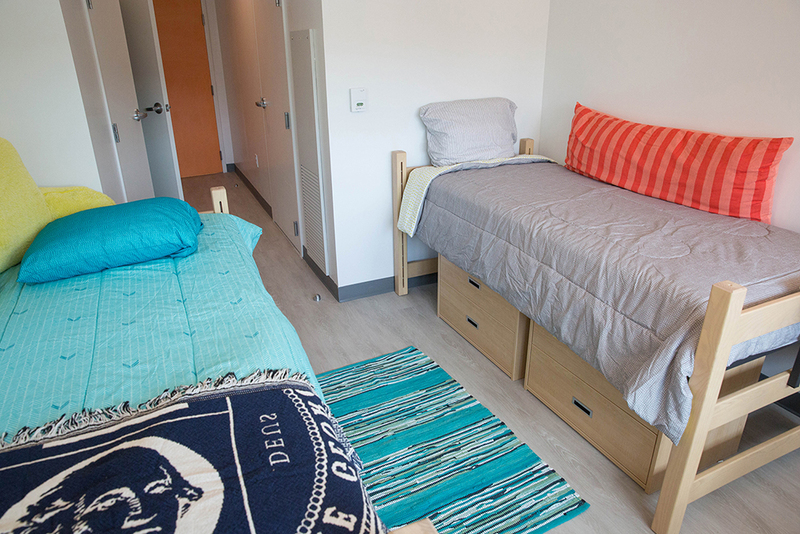 District House opened in the fall of 2016 incorporating the facade of three former halls into what is now GW's second largest residence hall. 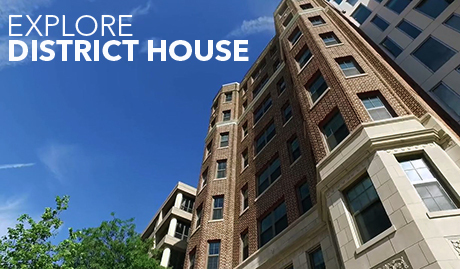 Located in the heart of campus, and only a block from the Foggy Bottom - GWU Metro Station, the building offers modern units many with a sweeping view that extends south over Kogan Plaza all the way to the Washington Monument. 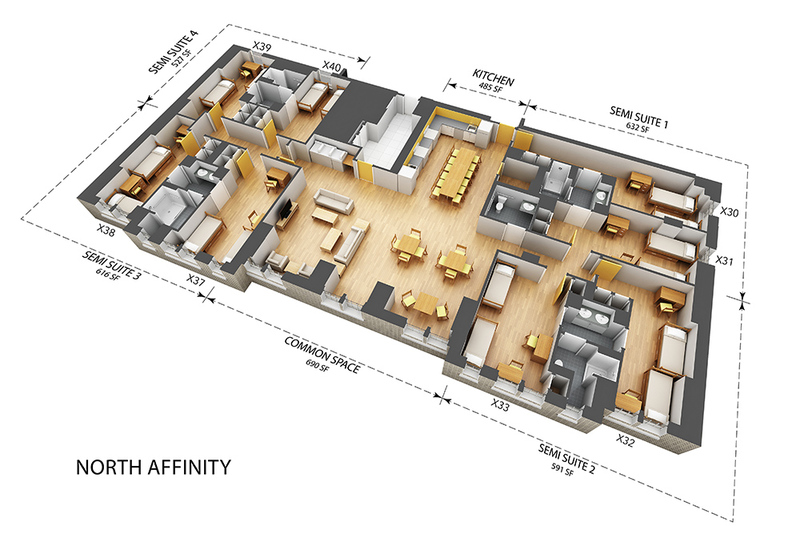 This one building has three different living options including 16 or 20-person Affinity Units, 4-person apartments, and 2-person studio units. 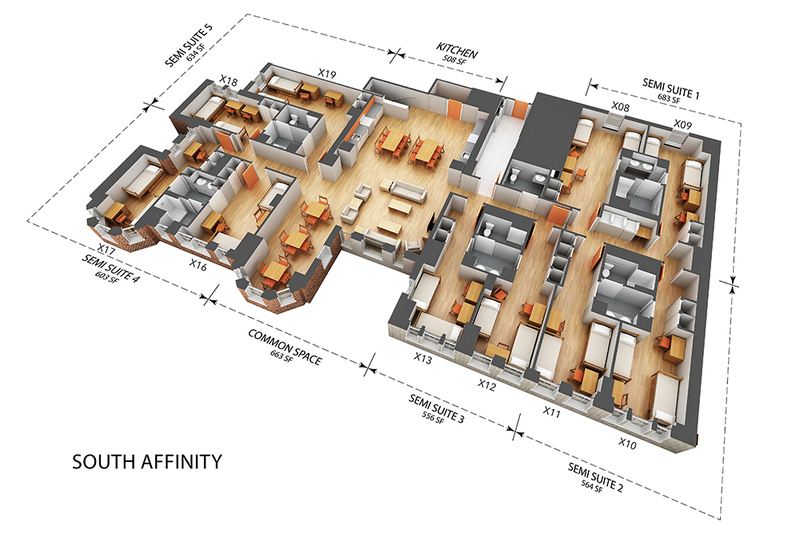 Long-Stay Groups will have the option to book the Affinity Units, 4-person apartments, or 2-person studios as part of their contracting process. 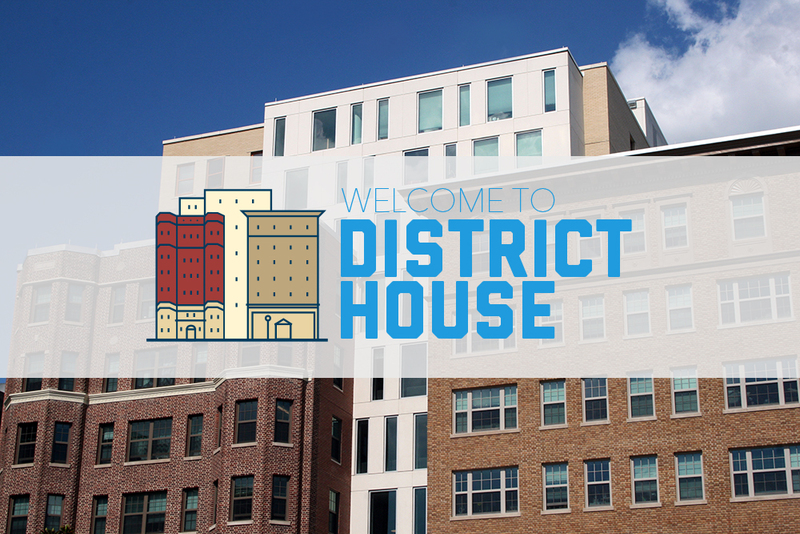 District House provides Long-Stay Groups a new way to approach their programming and community building with the Affinity Units. These units stretch the width of the building and house 16 students in 8 bedrooms in the North Affinities or 20 students in 10 bedrooms in the South Affinities. 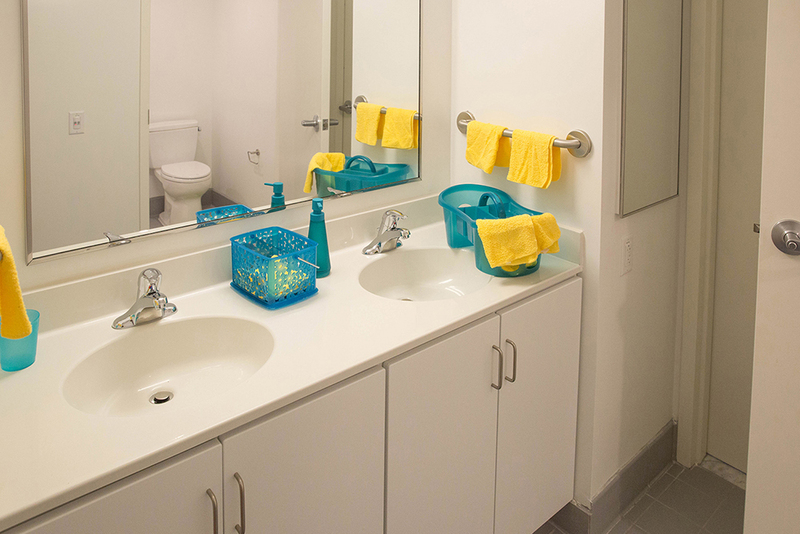 Within the unit residents live in 2-person bedrooms with an adjoined bathroom. 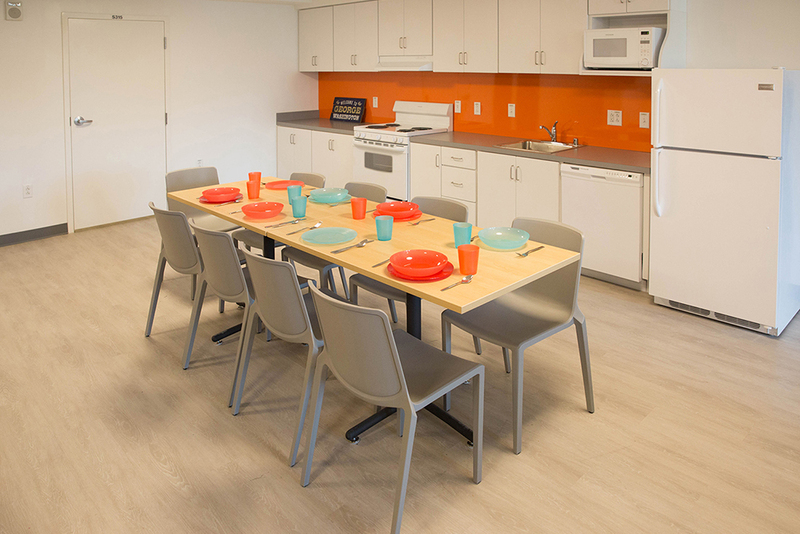 The kitchen is equipped with two of each appliance and seating for all of the residents of the unit. 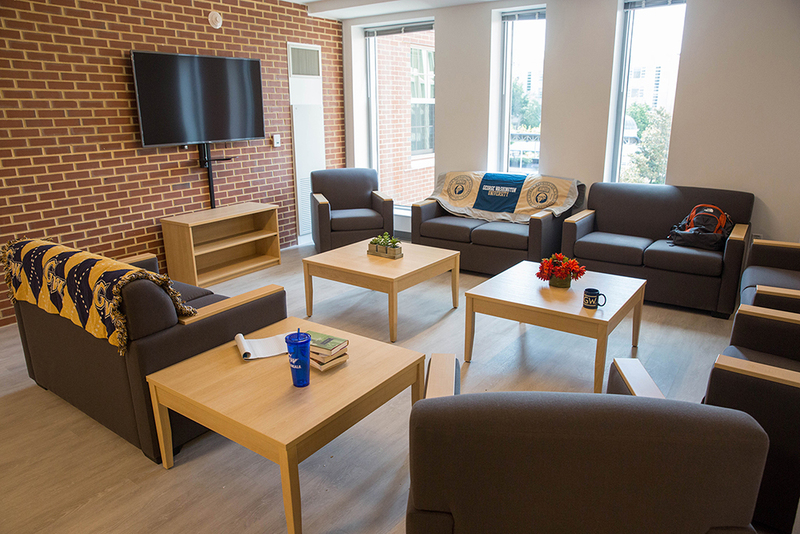 There is an additional study/meeting area with seating for each resident and a traditional living room with soft seating and a cable equipped TV. 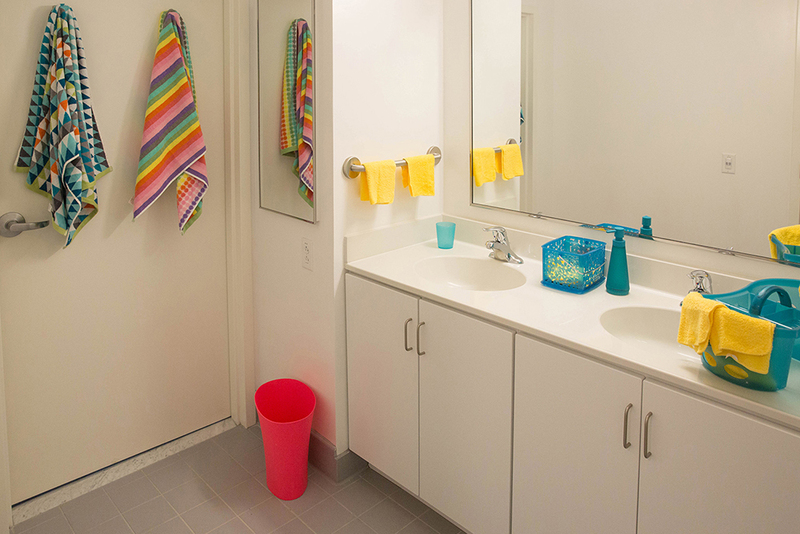 Washers and dryers are also located directly in the units. The Affinity Units are ideal for groups that are looking to build a sense of community among their participants where they live. 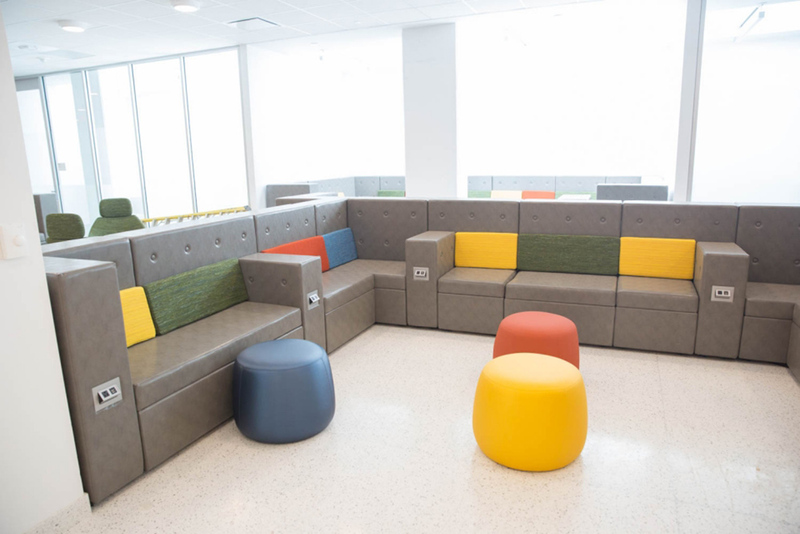 The common spaces also provide an opportunity to host meetings and small presentations in a casual setting right where the group participants live. 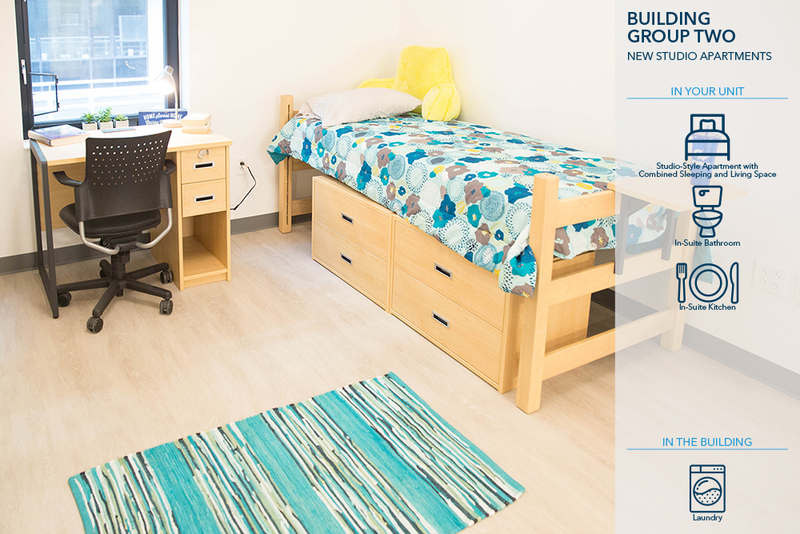 Please check the photo gallery below for images of the North and South Affinity Units including the bedrooms, living room, study/meeting space, kitchens, and floor plans. 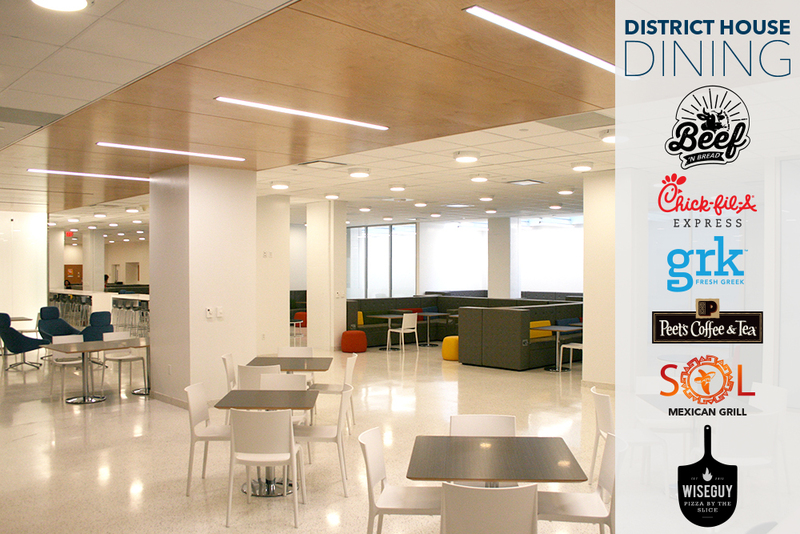 District House is located in the heart of campus next to the Marvin Center, Kogan Plaza, and Gelman Library. 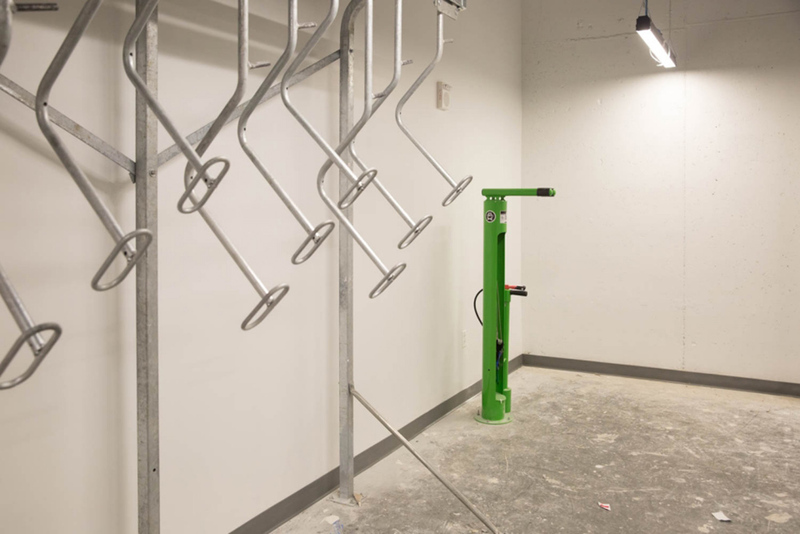 The Foggy Bottom-GWU Metro station, Whole Foods, and various other off campus conveniences are only one block away. 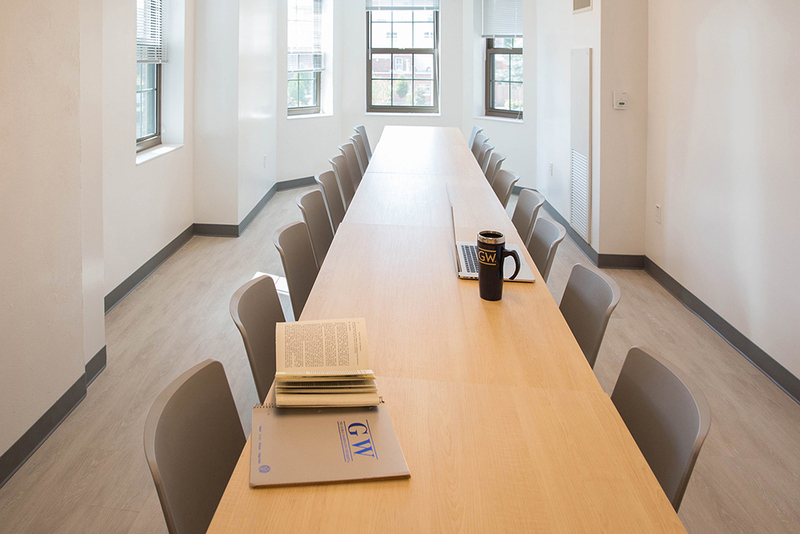 The building also includes 40,000 square feet of performing arts space, conference rooms, lounge and study areas in the lower levels of the building. 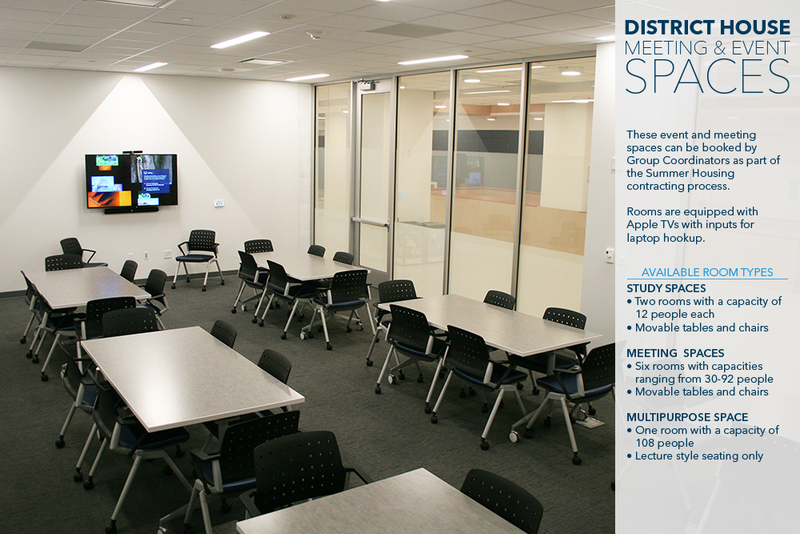 These meeting spaces are reservable spaces that may be booked as part of a Long-Stay Group contract. Additionally the retail and dining venues open to the public include Wiseguy NY Pizza, Beef ’n’ Bread, Chick-fil-A, GRK Fresh Greek and Sol Mexican Grill. Pete's Coffee is located street level at the I “Eye” St. entrance. 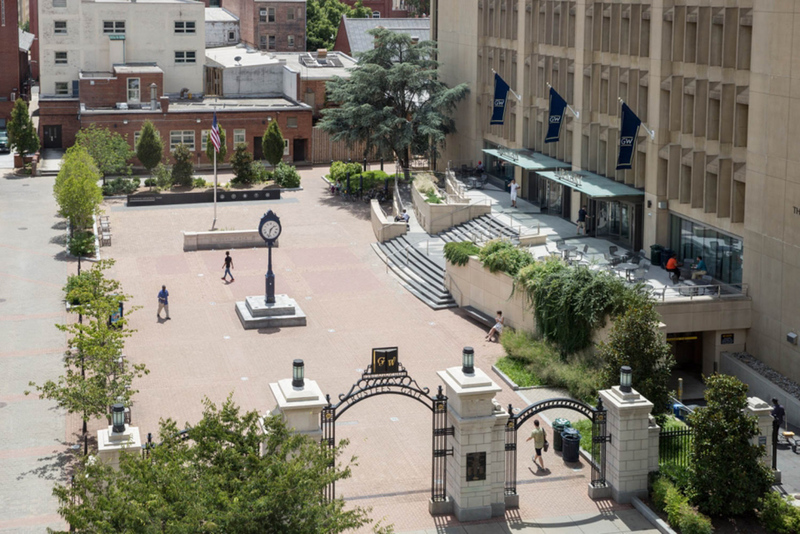 District House opened in the fall of 2016 incorporating the facade of three former halls into what is now GW's second largest residence hall. 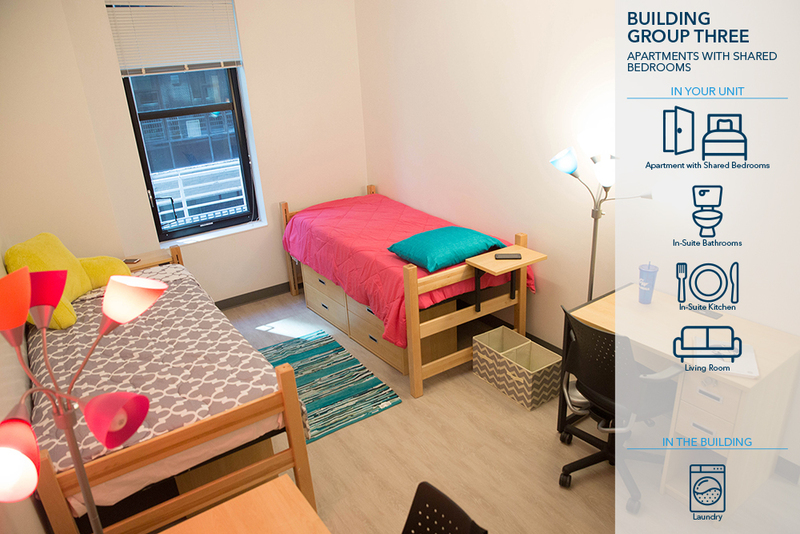 Located in the heart of campus, and only one block from the Foggy Bottom - GWU Metro Station, guets booking Building Group 1 apartments will enjoy a 2-person efficiency unit with a combined living and sleeping area, kitchen, and in-suite bathroom. The lower levels include lounge and meeting spaces as well as dining and retail spaces open to the public. The dining venues include Wiseguy NY Pizza, Beef ’n’ Bread, Chick-fil-A, GRK Fresh Greek, and Sol Mexican Grill. Pete's Coffee is located street level at the I “Eye” St. entrance. 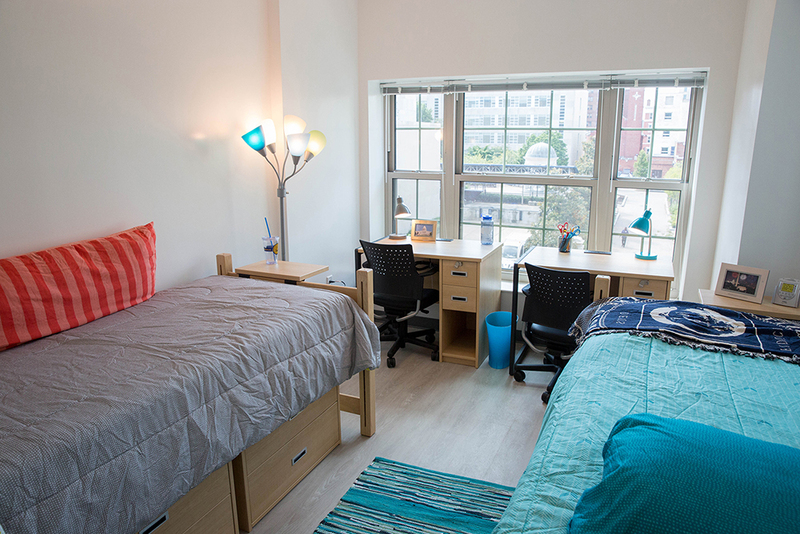 District House opened in the fall of 2016 incorporating the facade of three former halls into what is now GW's second largest residence hall. 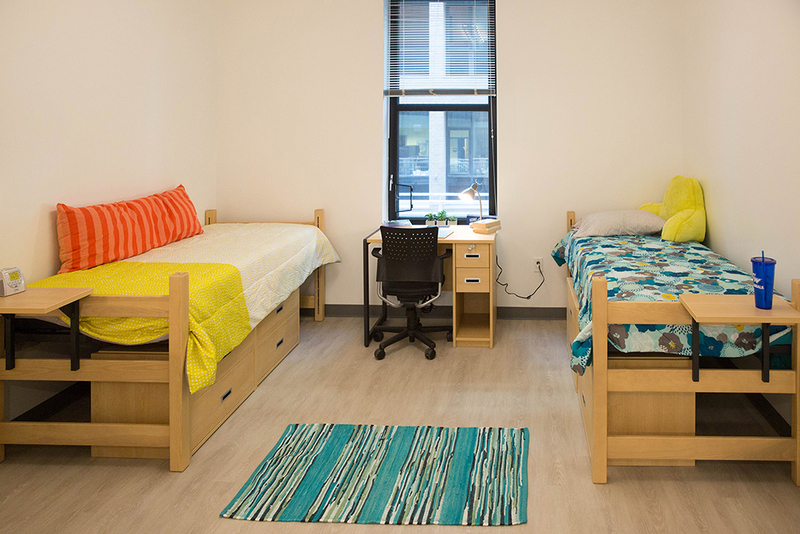 Located in the heart of campus, and only one block from the Foggy Bottom - GWU Metro Station, guests booking Building Group 3 apartments will enjoy a 2 bedroom 4-person unit with a living room, two full in-suite bathrooms, and a full kitchen. The lower levels include lounge and meeting spaces as well as dining and retail spaces open to the public. The dining venues include Wiseguy NY Pizza, Beef ’n’ Bread, Chick-fil-A, GRK Fresh Greek, and Sol Mexican Grill. Pete's Coffee is located street level at the I “Eye” St. entrance. 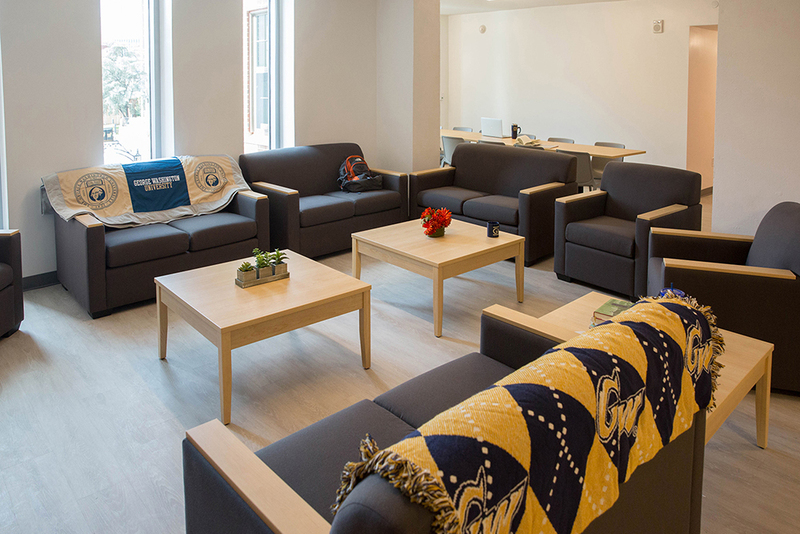 District House opened in the fall of 2016 incorporating the facade of three former halls into what is now GW's second largest residence hall. 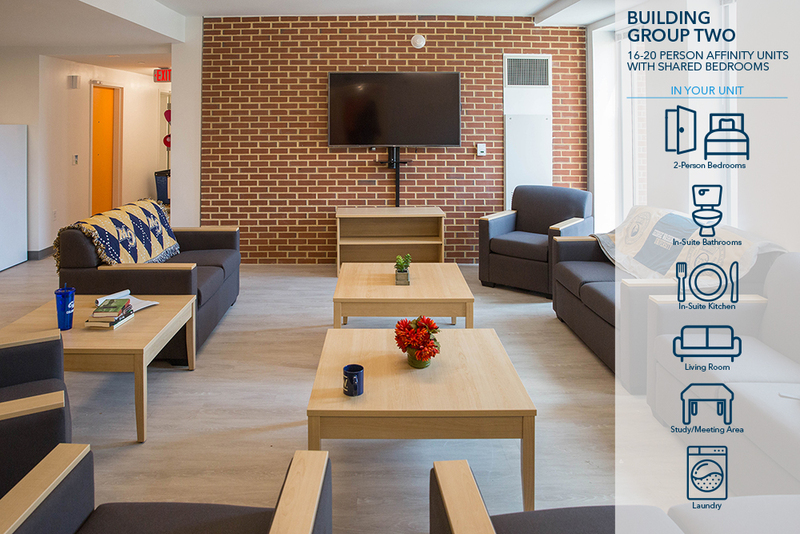 Located in the heart of campus, and only one block from the Foggy Bottom - GWU Metro Station, guets booking Building Group 3 apartments will enjoy a 2 bedroom 4-person unit with a living room, two full in-suite bathrooms, and a full kitchen. The lower levels include lounge and meeting spaces as well as dining and retail spaces open to the public. The dining venues include Wiseguy NY Pizza, Beef ’n’ Bread, Chick-fil-A, GRK Fresh Greek, and Sol Mexican Grill. Pete's Coffee is located street level at the I “Eye” St. entrance.